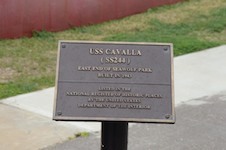 This is a photo tour of the USS Cavalla, SS244. 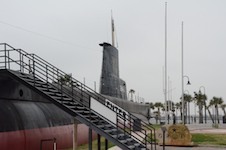 Cavalla was a Gato-class sub, commissioned during WWII and decomissioned in the early 1970s. 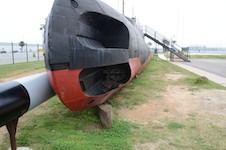 She resides at Seawolf Park in Galvesotn, Texas. These pictures were taken in March 2011. 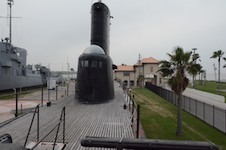 We start from the bow torpedo room and ending up at the aft torpedo room. 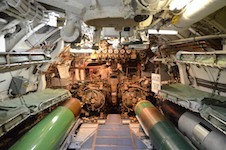 In between are the officer quarters, crew mess, control room, and the engine room. The upper bridge was closed. 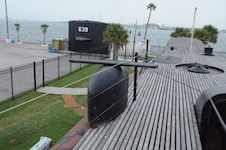 As with most of Galveston, the Cavalla was damaged by Ike in 2008. 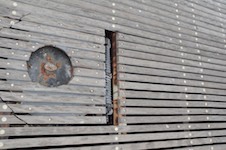 As part of the repairs, the top deck, which had previously been laid asphalt, was removed and replaced with more authentic wood planking. Other recent changes include the labeling of devices and controls. Overall, a great sub to visit, and in excellent condition. Exterior. Note new deck planking.